Bowling Green, Ky. -- August 10, 2011 - As the temperature continues to soar, so does the talent competing on the IGA Superstar Stage! And as the song says, “The heat is on...” well the heat is definitely on to see who will be named the winner of 2011 Beech Bend Superstar Contest! Week after week, contestants continue to bring their “A” game to the Superstar stage, hoping to make it to the final on September 3rd. After 8 weeks of competition, once again an all female lineup crossed the Superstar stage. It is definitely the females that are dominating, and what a powerhouse of females it is going to be. There are 4 weeks remaining for the males to break this winning streak! Come on guys....it’s not too late!! The winner of week 8 was Madison Michelle Hardy from Nashville, TN. Madison performed an Etta James song, “A Sunday Kind of Love.” Madison was born and raised in the small town of Philadelphia, MS. In 2007, she made the move to Nashville, TN to attend Belmont University. A recent Music Business graduate of Belmont, Madison now lives in the Nashville area, working as a receptionist while continuing to perform and pursue a career as a recording artist. Just as the contestants were hot and talented, so were the professionals judging Superstar. Judging the contest for week 8 was Marissa Butler, Russell Terrell, and Susan Myers. Marissa Butler loves Bowling Green, KY and that makes her a great fit as the Public Relations Director of the Bowling Green Area Convention & Visitors Bureau. Originally from Music City USA, Marissa moved from Nashville to attend WKU, receiving her PR degree in 1998. Marissa fell in love with tourism during her first job at Opryland theme park, followed by many years in the full-service restaurant business and a short stint in hotel sales. She and her husband have one very happy 10-month-old baby boy. Russell Terrell has been singing background vocals on master recordings (records) for 17 years and on demos and jingles for that much plus another 11. He works on well over a thousand songs a year, so if you listen to country radio at all you’ve heard him on songs by artists like Keith Urban, Josh Turner, Dierks Bentley, Craig Morgan, Tim McGraw, Reba, Luke Bryan, Trace Adkins, Pat Green, Blake Shelton, Toby Keith, Martina McBride, Joe Nichols, Garry Allan, Brooks and Dunn, Garth Brooks, Eric Church, Jeff Foxworthy, Jack Ingram, Justin Moore, Kenny Rogers, Lonestar, and newcomer Troy Olsen, plus others as varied as Michael Bolton, Johnny Mathis, Uncle Kracker and Christian artist Matthew West. You can also hear him on the movie soundtracks of Disney’s Home On The Range, Flicka, Joshua and Broken Bridges; on commercials for The Gap, Whirlpool/Habitat for Humanity, Prilosec and others; and on the current theme songs for NASCAR and CMT’s Trick My Truck. Susan Myers is from Nashville, TN and brings over twenty years of experience in the Music Business. She spent 17 years with Sony Music Nashville in various capacities and has been with the Nashville Songwriters Association International for 5 years. Susan’s goal is to encourage all singers and or songwriters to pursue their dreams. Robin White was the scorekeeper for week 8 of Superstar. Robin is a record producer and sound engineer and the owner of Disciple Productions of Portland, TN, a provider of sound, staging, lighting, and live event productions. 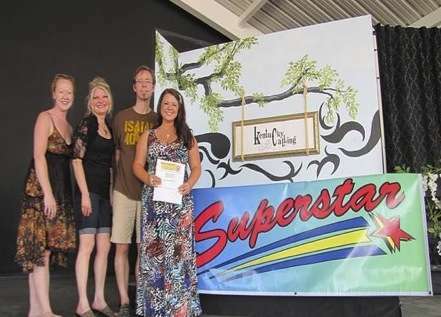 If you want to pursue a singing career, then you don’t want to miss the opportunity to perform on the IGA stage at Beech Bend in the Superstar Contest. Choose your song, choose your date to compete and join us! With only 4 weeks remaining to compete, time is quickly running out. Don’t be found without YOUR spot! Our finale is September 3, 2011. 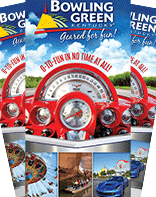 Beech Bend Amusement Park and Splash Lagoon Water park is family owned and operated providing affordable fun for the entire family. Beech Bend’s IGA Stage is showcasing exceptional talent that continues to come from Iowa, Oklahoma, Milwaukee, Pennsylvania, West Virginia, Kentucky, Tennessee, Indiana, Florida, Texas, Illinois, and even as far away as Canada. For more information about Beech Bend Superstar Contest, log onto the Beech Bend website at http://www.beechbend.com or send an e-mail to our talent coordinator, Devona Horn, at beechbendsuperstar@gmail.com. Provided by Sherry Clouse, Producer, Beech Bend Park.